In need of a GDPR Compliance Solution??? GDPRpop is the answer. GDPRpop is the only app that lets you do "copy & paste" to put your site (usable on unlimited sites) on the GDPR compliance path. Cloud hosted, All-In-1 place, & much more! Manage everything from one central location with GDPRpop. Buy Now! GDPRpop can have everything in place for you in only 3 easy steps. GDPRpop works on all existing apps, sales pages and more….regardless of if they are normal HTML, WordPress or some 3rd party page builder. You simply create your GDPR compliance campaign and copy & paste one single line of code, then you are done. The GDPRpop app will appear on that site and add everything you need. Cookie consent is where users must agree for you to create cookies. Cookies are essential for most marketing functions, so getting users to agree is important, and doing it without agreement is illegal. Some of you may just have 1 site while others may have a whole set of sites and apps. GDPRpop has an option for both, with the unlimited sites being the best value (and on sale as a special offer during this deal). You can edit and customize all the content that is created inside GDPRpop, and even add videos & images to what is shown to users. You can control fonts, colors….everything. This makes sure you are compliant, without it ruining the look of your site or app. You need to give users a way to request all the data you hold on them. In GDPRpop we have built this request function into the app. Users fill out the form, the request hits your inbox and then you can comply with their request and give them the data they need. Users can also contact you to ask that they are “forgotten” which in practice means, all the data you have on them is deleted. This is another function we have automated. Users simply fill in the form, click submit and it comes to you for you to act on it. You don’t need to download or install a single thing. Simply log in, click create, add some basic info and save it. Then copy and paste the 1 line of code to the site you need to make compliant, and you are done. 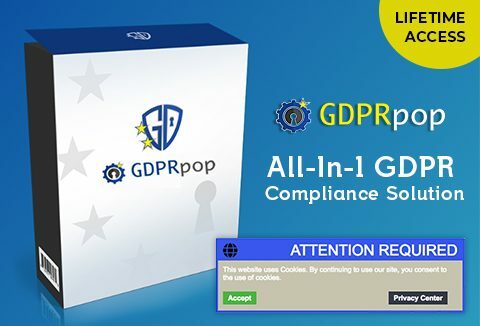 With GDPRpop, ALL your GDPR compliance is in one place. If you need to add a new T+C, you can do it for ALL your sites by simply making 1 edit. This is a huge time saver! Imagine how long it would take if you used a plugin or manual code, and you had to edit it in 10+ places? You can set up your GDPR campaign to show only to visitors to your site from the EU, or if you want you can set it to show to everyone....it's up to you, we have built this function into the app to give you maximum flexibility. As part of GDPR, you must log when a user accepts your terms and thereby consents to your use of their data. We have built this into the app, and all consent data is stored and can be accessed at any time. GDPRpop gives you immediate GDPR Compliance with "Copy & Paste" Simplicity fro any App, Website or Page your own without needing expensive software or doing time consulting research. GDPRpop is good for unlimited websites. Updates are included with this purchase. This can be used for personal as well as your client sites. Instead, get one central app or hub that can control it all! Simple to use, it offers every GDRP tool you need to be ok for the european customers. Thanks !